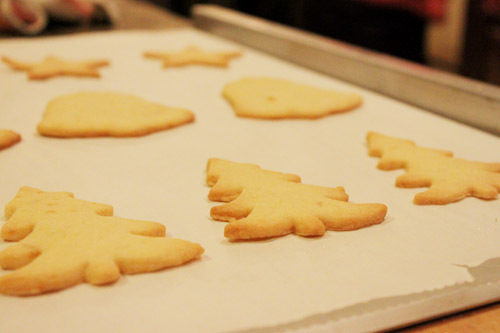 In between filming our melodramatic NY Jets-meets-out-of-sight-Pot-Roast video, Marmo and I made more Christmas cookies. As I mentioned on Twitter, The Box laid waste to the butter cookies (actually, Marmo made more of them and hid them in a top secret spot – he hasn’t found them yet!). But we needed more butter cookies. This time, we decided to branch out a bit. 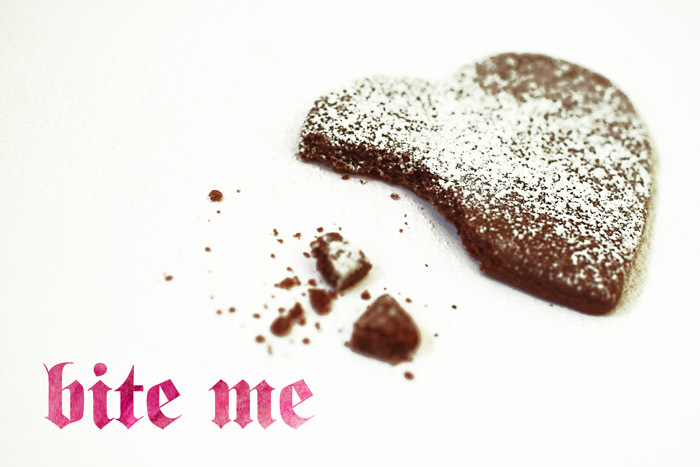 Marmo found a fantastic recipe in the Holiday Edition of Food and Wine: Ginger-Studded Sugar Cookies, in which you use crystallized ginger. Crystallized ginger is, if you didn’t know, awesome. 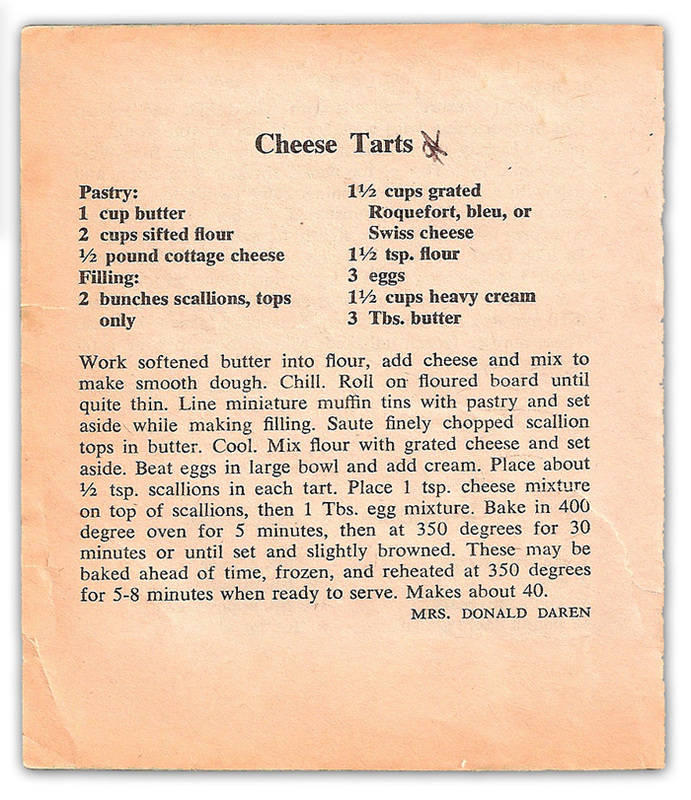 I was totally on board with this recipe. Also, it involved decorating them with shiny little balls of sugar, which I was also excited about. Incidentally, Marmo left me a voicemail telling me to go purchase said glittery sugar balls at a baking supply shop near my office. I never listened to her voicemail. I usually ignore all my voicemails, just so you know. Don’t leave me one. Anyway, she had the presence of mind to figure this out for herself and get us some. And so it began! In a standing electric mixer fitted with the paddle, beat the butter with the flour and salt at low speed until smooth. Add the confectioners’ sugar, ginger, vanilla and orange zest and beat at low speed until smooth. Divide the dough in half and shape into 2 disks. Wrap the dough in plastic and refrigerate until firm, about 1 hour. Preheat the oven to 350° and line 2 baking sheets with parchment paper. Working in batches if necessary, roll out the dough a scant 1/4 inch thick on a lightly floured surface. Stamp out shapes as close together as possible. 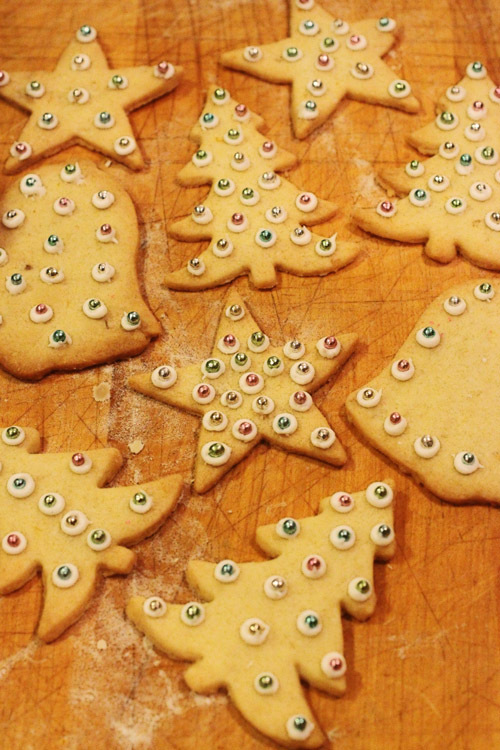 Arrange the cookies 1 inch apart on the prepared baking sheets. Bake until lightly golden, 14 to 18 minutes depending on their size. Transfer to a rack to cool. Meanwhile, refrigerate the scraps until chilled, then reroll, stamp out more cookies and bake. 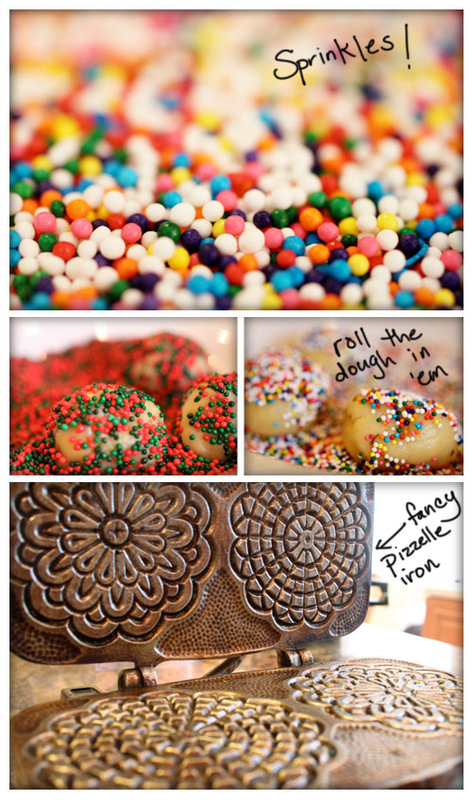 Decorate the cookies with Royal Icing, colored sugars and silver dragées. 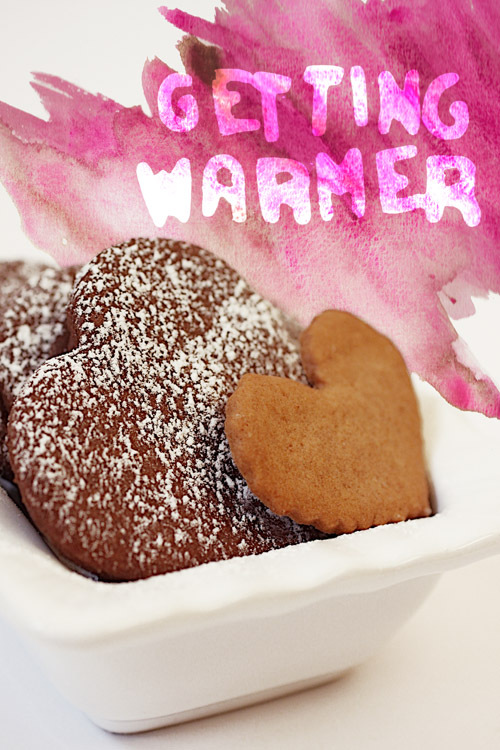 The baked, undecorated cookies can be wrapped well and frozen for up to 1 month. 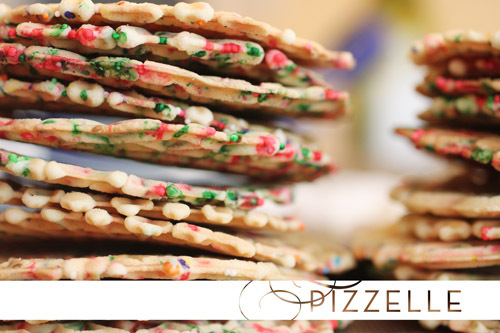 The decorated cookies can be kept in an airtight container for up to 5 days. In a bowl, beat the egg white at medium speed until foamy. 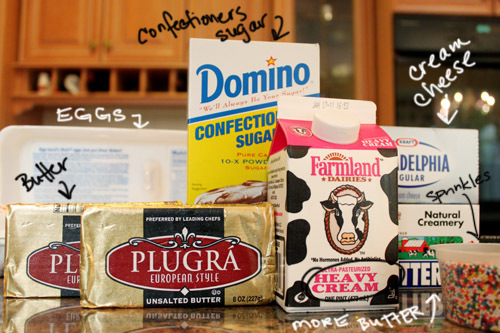 Add the sugar, 1 cup at a time, beating between additions until the sugar is completely incorporated. Add the lemon juice and beat at high speed until the icing holds its shape, about 5 minutes. Thin with water as needed. 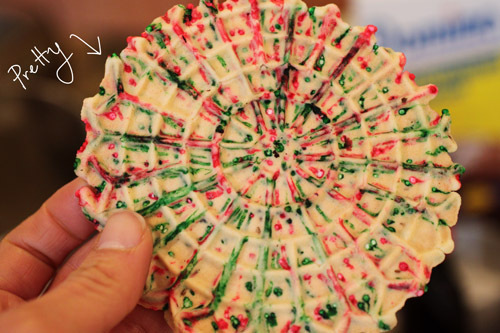 Throw some icing into a pastry bad and pipe onto the cookies. If you don’t have a pastry bag, no problem. Get a Ziploc bag, trim off a teeeeeeny-tiny piece of one of the corners and use that to pipe your icing. 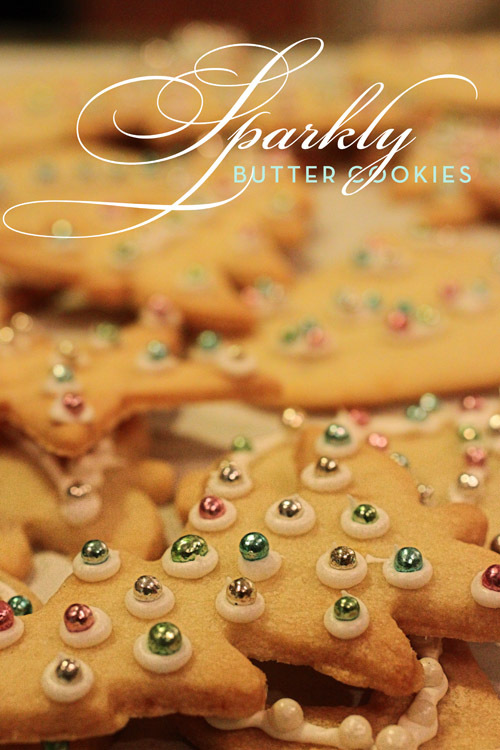 Notes: It’s much easier to apply the little, shiny colored balls to the cookies with tweezers. Really, we tried it. HUGE difference. 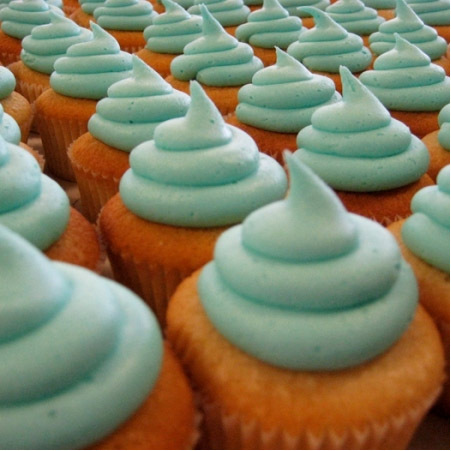 For fun, you can add some food coloring to the icing. We did some in light blue. Also, you cam make these any time of year. 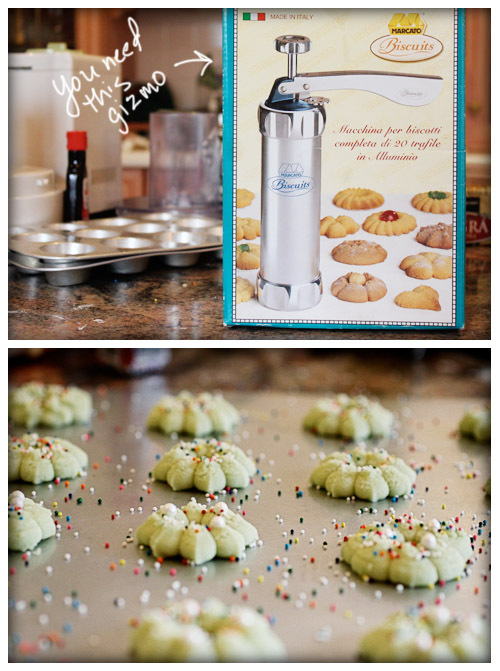 Just get differently-shapped cookie cutters. 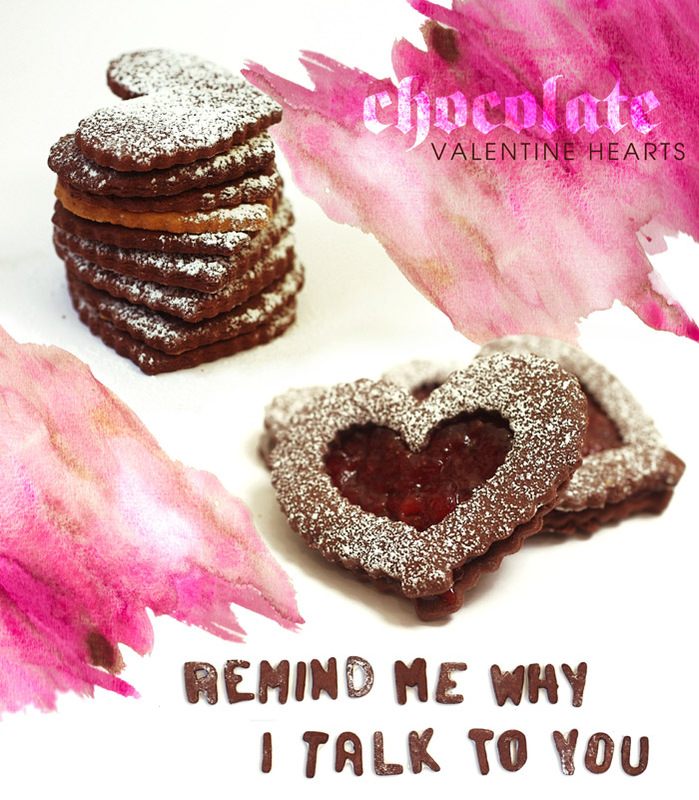 Like a groundhog-shaped one for February. This recipe is really flavorful. The pork loin roasts up quite juicy and savory (with the herbs and salt). Topping it with cranberry relish gives it a nice sweet contrast. 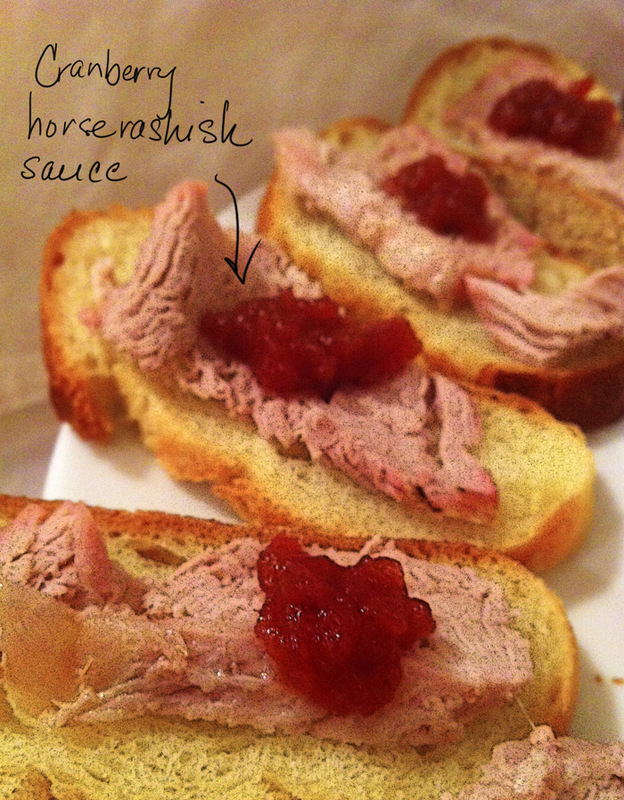 The added punch from the horseradish (in the cranberry sauce) brings the flavor over the top. Place the pork tenderloin in a roasting pan and sprinkle with herbs and salt. Drizzle with olive oil. Roast until done – about 45 minutes depending on the thickness of the tenderloin. Remove from oven and let set for about 30 minutes. Cut in thin slices and place on sliced bread. Top with Stonewall Kitchen’s cranberry horseradish sauce and serve! Recipes seem to be collected quite randomly in Marmo’s kitchen. Moving on! We also had the famous Gruyere and Caramelized Onion Pizza (recipe here), which disappeared in a snap. I got a little adventurous and concocted a Raisin Mostarda, which I have been obsessed with ever since I started frequenting Anfora Wine Bar and eating all their Ricotta cheese (which is served with a raisin mostarda). Heat a little olive oil in a medium saucepan over medium-high heat. Add the onion, ginger, and garlic and sauté until soft – about 5 minutes. Stir in the OJ and all the ingredients up to the cumin. Bring the whole concoction to a boil, then reduce the heat and let it simmer for about 15 minutes or until most of the liquid is absorbed. Remove it from the heat, let it chill for about 10 minutes. Then stir in the marmalade, mustard and salt. Give it a taste and see if it needs anything else. Then let it hang out in the fridge to chill until you need it (covered, of course). It’s pretty good, though it’s not like Anfora’s. Honestly, next time I think I will leave out the curry. I liked the flavor, but I think it might be better without it. I served it with Ricotta crostini drizzled with honey. Onto dessert! 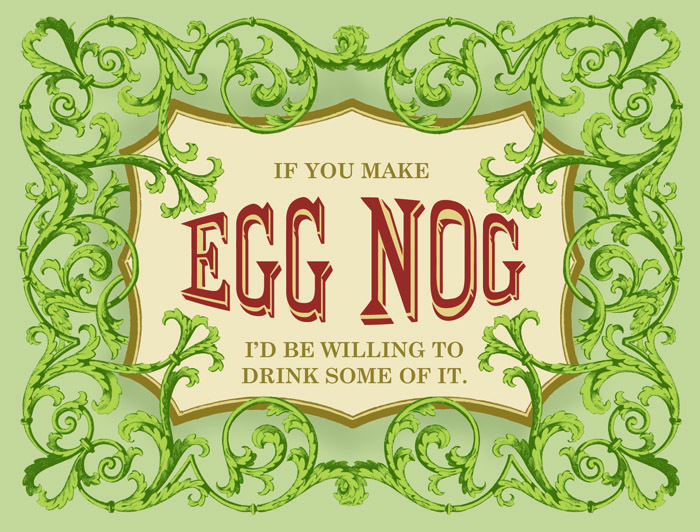 What kind of sweets do you offer a bunch of festive maniacs that have had A LOT of wine? And beer. Did I mention that John just HAD to buy PBR lights? Cuz he did. An entire case of them, in fact. Still not sure why. Anyway, I got cupcakes from Sweet in Hoboken. They have some amazing flavors, and I told them to give me a mix of their mini cupcakes. 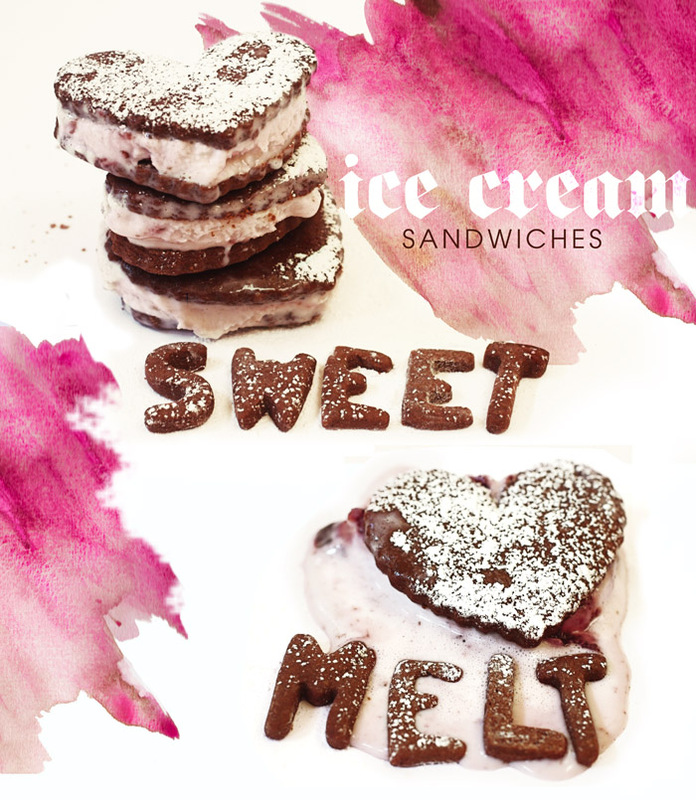 * Picture from Sweet’s website. The cake part of these cupcakes is really moist (impressive for the mini cupcakes) and their cream cheese frosting is award-worthy. Especially on the Red Velvet cupcake. My favorite is the Marshmallow, which is a chilled ganache cupcake topped with marshmallow meringue. Out of sight. I supplemented the cupcakes with my Russian Tea Cakes (a Iaciofano Family Christmas special – recipe here). 1. Katy Perry’s Firework – John would NOT STOP playing this song. 2. Mariah Carey’s All I Want for Christmas Is You – I couldn’t help it. 3. Bell Biv Devoe’s Poison – You should see people get down to this song. Yeah, even me. 4. Queen’s Fat Bottomed Girls – Gotta love that one. 5. B.O.B’s Magic – So John and I could relive our pizza glory days. 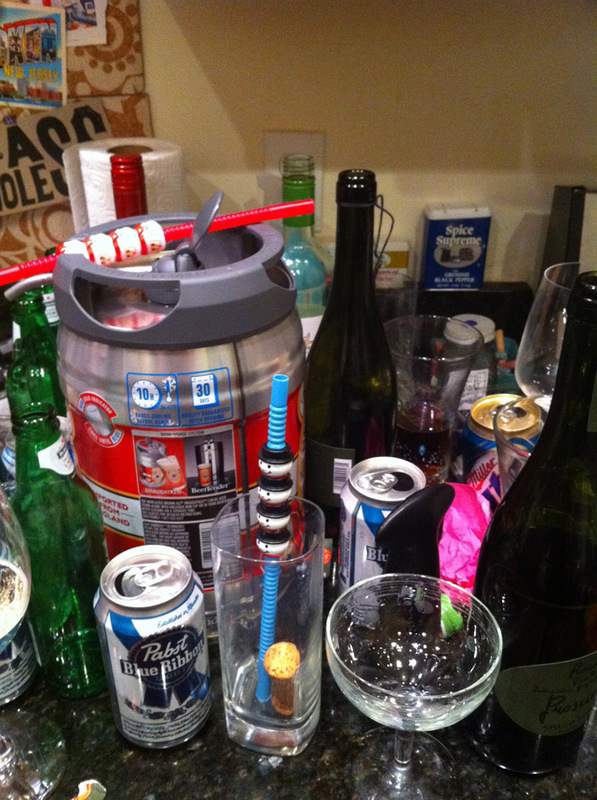 * I wasn’t kidding about the PBR Light! 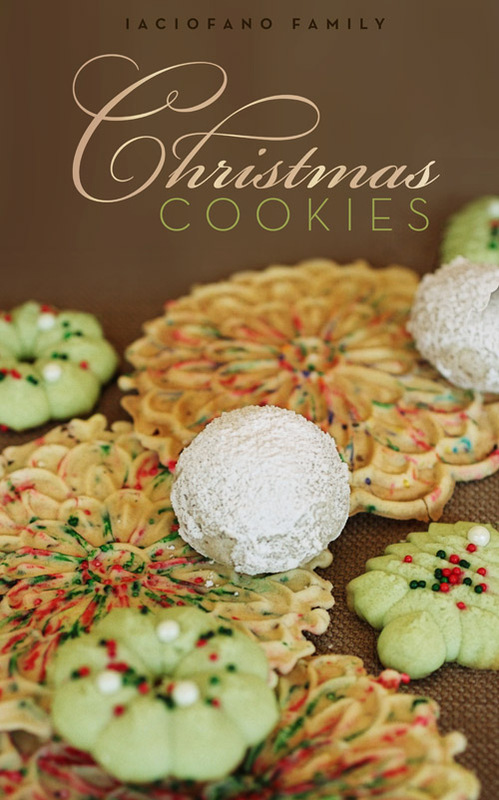 Like many families, the Iaciofanos have their own Christmas cookie traditions. We work with a general rotation of around 18 different species of cookie, depending on Marmo’s level of energy for baking (unbounded), our relative moods, and the amount of free space in the house for cookie hiding places. So we hide the cookies. Under side tables, up in high cabinets, inside dresser drawers, in the dryer. It only throws them off temporarily, but that’s usually all we need to make it to Christmas. Beat the eggs, adding sugar gradually. Beat the sugar and egg mixture until smooth. Add the COOLED melted butter (if you don’t cool the butter you will cook the eggs when you add it in). 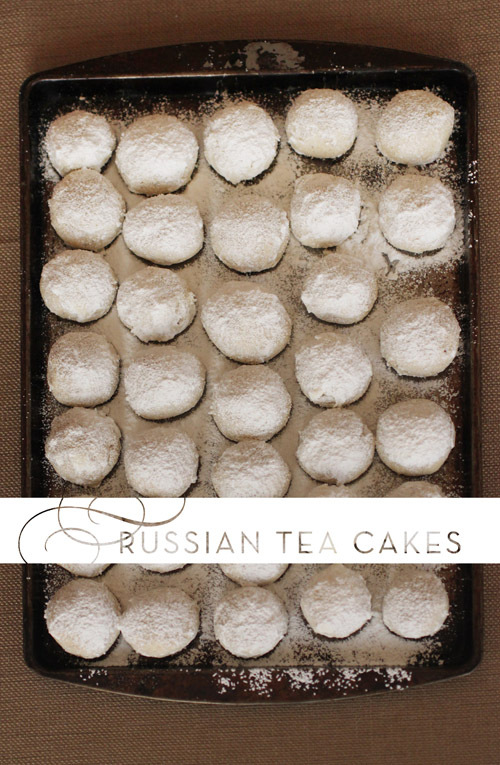 John loves the Russian Tea Cakes (an extremely close contender to the Pizzelle for me). 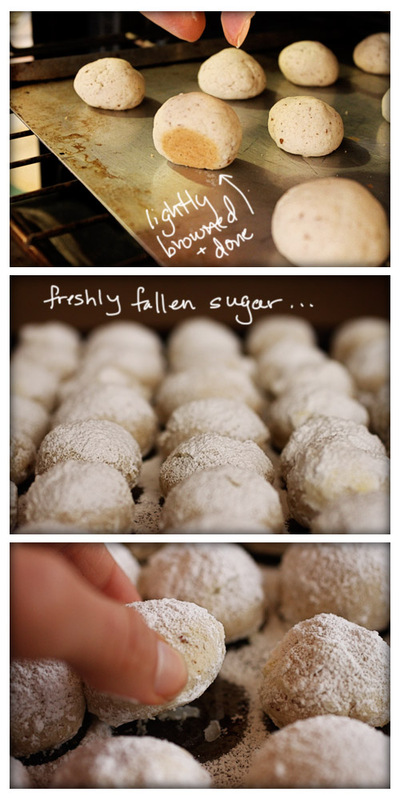 Dusted with confectioners sugar, these buttery, pecan-y snowballs practically melt in your mouth. You can always tell when someone’s been at them, however, as the confectioners sugar tends to make a mess and you end up looking like the powdery version of a child with his first ice cream cone. The following Russian Tea Cake recipe has been handed down from my grandmother (on The Box’s side) and is surprisingly easy. Roll the resulting dough into 1″ balls. Place on an ungreased cookie sheet and bake at 350 degrees for about 15 minutes (may need a few more minutes – the bottoms of the cookies will turn a light brown). 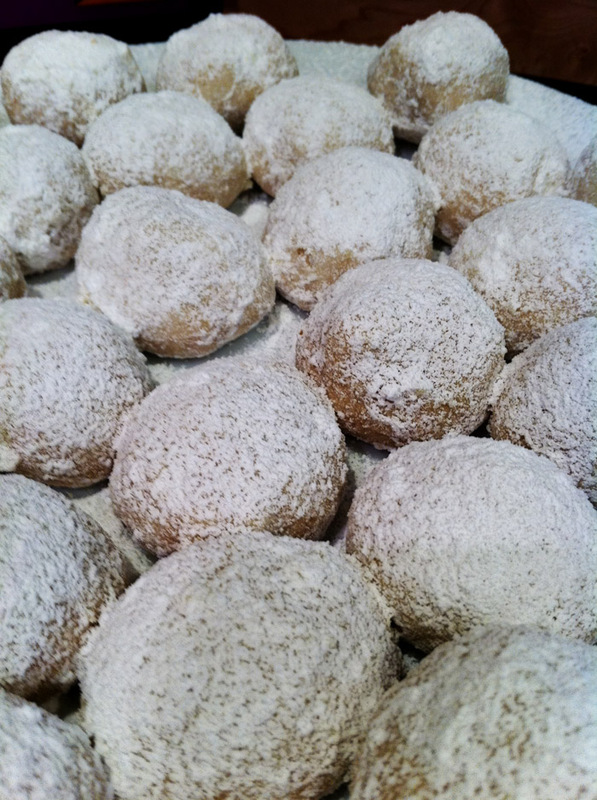 Remove them from the oven and while the are still warm, roll them in confectioners sugar. 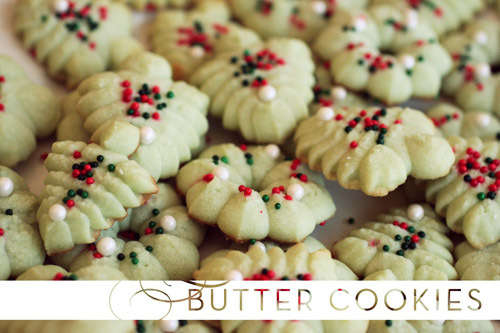 When you’re done, get a hold of some cookie tins in which to store all this buttery madness. The ones we have are horribly cheesy. Some of ’em are pretty darn old too. But they work. Then hide them around the house. If you’re lucky, you’ll forget where you put them and come across them accidentally in April while Spring cleaning your gutters.